Alex Lloyd Gross Photo- Delaware Valley News.com The display at Clark and Dungan Street. A display in support of President Donald Trump’s attempt to fund a border wall is on display in northeast Philadelphia. It sits on the front yard of a corner house at Clark and Dungan streets. Some people are calling this vulgar and offensive. It’s a sign, on a sandwich board and a dry erase board. The signs are about building a wall which is the sentiment of quite a few Americans. 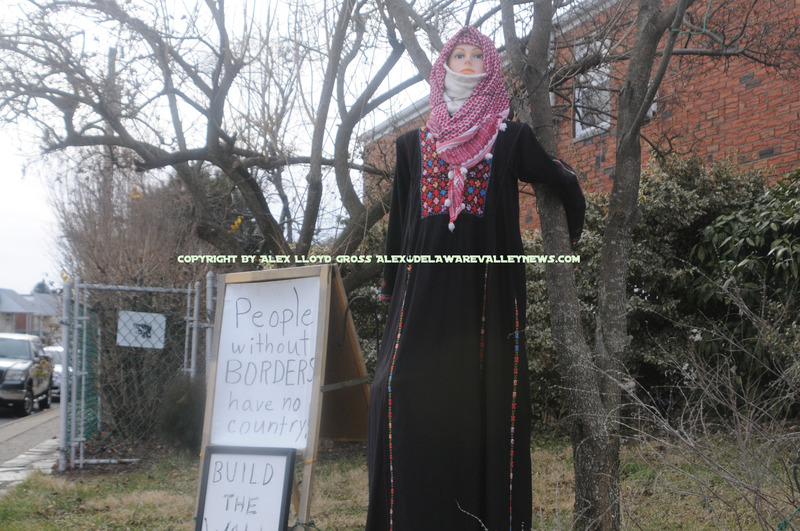 Right next to it is a mannequin dressed as a female Muslim. That is the part of this display in which people will find offense. They will also find confusion, as most Muslims do not enter the United States through the southern border. This mannequin is set up next to a tree and appears to be rooted down with a stick. It has Muslim head wear and a long dress. With two Muslim congresswomen being sworn in and denouncing Israel, sentiment is high on both sides of the issue. Israel has a right to exist and that fact will get some people upset. No one was home when Delaware Valley News.com knocked on the door for comment. Vehicles that drove by slowed to get a better look. It is unknown how long this display has been up or will stay up.